The styloglossus muscle is one of the extrinsic tongue muscles and is the shortest and smallest muscle from the Styloid muscle group. 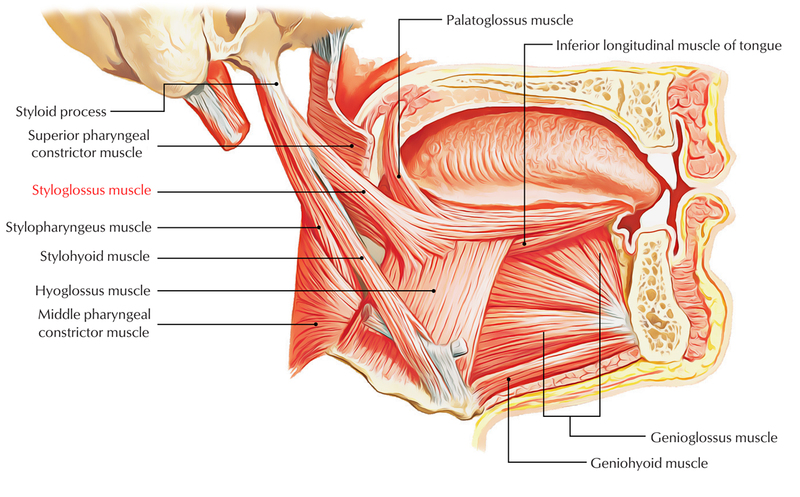 The styloglossus muscle emerges via the anterior margin of the styloid process near its apex, and through the stylohyoid ligament. Styloglossus curves forwards and medially, and is attached into the lateral as well as inferior side of the tongue. Its fibres extend in order to intersect crosswise with those of the palatoglossus and hyoglossus muscles under the submaxillary gland along with the mucous membrane of the tongue. Hypoglossal nerve supplies styloglossus muscle. It draws back the tongue upwards and backwards. It is antagonist to the genioglossus. It creates a median channel on the dorsum of tongue for the transport of food together with its equivalent of other side.